All Laurel businesses need to shred their private company documents. One small mistake leading to a leak in information could lead to a world of consequences that will decide the fate of your Maryland company. So how can you be sure that your information is never seen again? If you need to destroy your documents, you have many different options, and you can choose the one that fits the specific needs of your business. Whether you prefer the convenience of on site shredding, or you need the power of an industrial shredder at a secure off site facility, it's important that you are confident in the complete destruction of your information. One benefit of on site shredding it that it gives you the ability to see your documents or devices being shredded at your Laurel location, right in front of you. This adds an extra level of security in comparison to other services, but even this is not sufficient in assuring that you and your clients’ information stays safe. 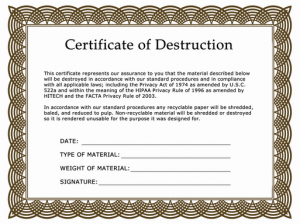 To ensure your confidential information is properly destroyed, you should have the company performing your services provide you with a Certificate of Destruction to protect you in any possible legal situations. Trusting that the company performing your shredding services will follow all safety and security standards should be a deciding factor in your choice. At Laurel Paper Shredding Service, our contractors are required to abide by all federal and Maryland data destruction laws. The more details included on the certificate, the better off you are. If there is ever any question related to the security of the documents you have shredded, the Certificate of Destruction serves as physical, detailed evidence of that proper destruction. If you are sued or audited, this certificate is what will keep you protected. Before leaving the fate of your confidential information in someone else’s hands, be certain you are working with a thorough, reliable company that you can trust will provide you with documented proof of your shredding service. Contact Us for Free Quotes on Shredding Services in Laurel Today! If you’re interested in a shredding service but aren’t sure where to start, you’re in the right place. Laurel Paper Shredding Service is dedicated to providing secure data destruction service options to individuals and businesses in Laurel, DC and Baltimore. Simply fill out the form to the right, or give us a call at (240) 560-5105.